GroupHEALTH Benefit Solutions, an employee benefit plan administrator, relied on a manual paper-based benefit enrollments process that had a negative impact on customer experience, and was labor-intensive and inefficient. 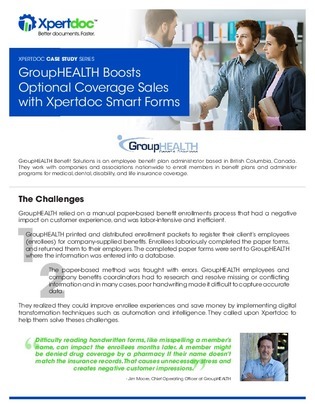 In this case study, find out how Xpertdoc’s Smart Form technology helped GroupHEALTH improve enrollee experience, reduce errors, and increase its optional coverage sales by 5,000%. Download this white paper to explore the complete success story and learn how your organization could benefit from Xpertdoc’s Smart Form technology too.